When we started our ‘Your Pet, Your Hero’ competition earlier this year, hoping to track down some of the UK’s most heroic pets, we couldn’t have imagined we’d get such an amazing response! There were countless entries from all around the country that included amazing and emotional personal stories of how pets have stepped up to be truly heroic! However, there could only be one winner! At The Insurance Emporium, we spent many an hour trying to choose our favourite. Here’s the story of our winner, Ember! 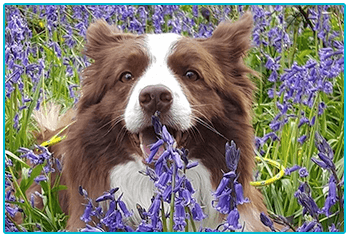 We spoke to Ember’s owner, Carla, who told us that they took on Ember, a red and white Border Collie, in 2011 from a breeder. She’s tried her hand at agility and breed showing but her “most important job is as a well-loved family member”! Ember shares her home with four other dogs, three of which are also Border Collies and a Chinese Crested Riot! The youngest Border Collie, Sherlock, is only nine weeks old but will be following in Ember’s footsteps soon! That’s one energetic household! Ember is a talkative pup and according to Carla “loves to chat and make some very funny noises!” She’s a very busy and smart pup who likes to find her own mischief but, more than anything, loves to cuddle up with people! When it comes to fun, Ember can often be found using her nose to find things and playing hide and seek games for her dinner. Of course, that’s when she’s not teaching her doggy ‘little brothers’ how to wrestle or finding some mud to roll around in! Ember is currently in training to be a part of the first ever Lowland Rescue search and rescue dog team on the Channel Islands! 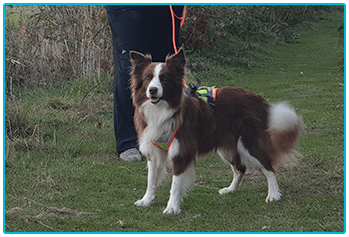 Carla explained, “I went along to a training session to be a missing person and was hooked on how much the dogs enjoyed using their noses to find people. When I investigated more into the brilliant work that Lowland Rescue and their volunteers do, I wanted to be part of that too!” Ember is now learning to be a scent-specific search dog, meaning she is learning to follow and find individual people by their scent. Ember has loved every minute of her training! As Carla put it, “she works hard every time we go out and often gets back in the car tired but happy, usually muddy with a big doggy grin!” Her training involves learning to sniff an item of clothing or set of keys belonging to her missing person and then following the scent to try and find them, most importantly ignoring other distractions! She’s also learning to sit by the missing person to show that she’s found them! Ember is a member of a team consisting of four other handlers and nine other dogs. Some of the dogs are specific ground scenting dogs like Ember and others ‘any human scent’ dogs, they cover a large area and alert their owners when they find a human. Ember will be called out and asked to look for and follow the scent trail of a missing person, or indicate if there is no trail to cover! She will play an important part when trying to find a missing person as quickly as possible! We’re sure everyone will agree that Ember truly is a hero! Whether she’s at home looking after her family or playing a part in a lifesaving rescue mission, Ember is certainly more than your average dog! 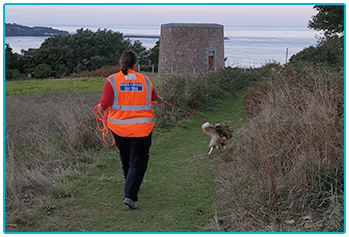 There were so many wonderful entries into our competition but Ember’s work to help set up the first ever dog search and rescue team on the Channel Islands really did steal our hearts! We’d like to thank everyone that entered for sharing their stories with us and reminding us that our pets genuinely are heroes! Congratulations and good luck to Carla and Ember! Ember’s amazing story doesn’t end here! Watch this video to see her in action live on ITV! This blog is in no way sponsored, endorsed or administered by, or associated with Lowland Rescue.